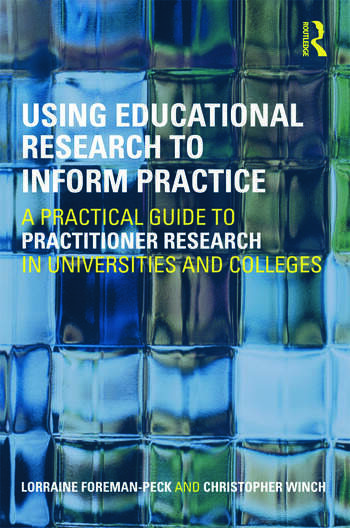 This book gives practical guidance on how educational research can inform professional practice. Written in a clear and accessible style, it details the way in which evidence based knowledge can be used to develop teaching and learning, bringing together a range of resources for all levels of reader but specifically designed to aid the progressive practitioner researcher. The authors draw on their experience of empirical work in education to provide thoroughly up-to-date reference material, including illustrative case studies, practical guidelines and exercises, and definitions of educational and research terms. The case studies and critical literature surveys have been chosen to demonstrate the use (and mis-use) of research evidence in thinking about a range of important topics in further and higher education, such as, learning styles, deep and surface learning, dyslexia in higher education, the assessment of group work, teaching critical thinking, problem based learning, and dissertation marking. Drawing on their philosophical backgrounds, the authors also address the much conceptual confusions which have led to scepticism regarding the wisdom or even the possibility of using research evidence to inform teaching. Using Educational Research to Inform Practice provides the necessary understanding for conducting research, thinking about its value and applying research evidence to practice in universities and colleges and therefore will be essential reading for those resource managers who are responsible for providing courses and support in higher education institutions. In addition, this book is particularly aimed at further and higher lecturers undertaking professional development courses and experienced and senior staff who wish to use research to improve management practices. Lorraine Foreman-Peck is a Research Fellow in the Department of Educational Studies University of Oxford, and Visiting Professor University of Northumbria. She has extensive experience in curriculum development and in teaching research methods and has led research, evaluation and development projects in three universities. Christopher Winch is Professor of Educational Philosophy and Policy in the Department of Education and Professional Studies at King's College, London. He has taught in primary, further and higher education. His interests are in professional education, philosophy of education and the philosophy of educational research.